A few years ago, I attended a discussion at the Museum of Jewish Heritage in Manhattan about Franklin Roosevelt and the Holocaust. The featured speakers, historians Deborah Lipstadt and Richard Breitman, gave sensitive and nuanced accounts of the period that were steeped in their own research and a deep knowledge of a time that has become one of the most closely examined ever. They discussed Roosevelt’s strengths and weaknesses as he confronted demands that he rescue Jewish refugees from Nazi Germany while preparing America for war in the face of fierce isolationism, nativism and anti-Semitism at home. After an hour, the session was opened to questions. An elderly woman stood up and identified herself as a Hungarian Holocaust survivor who had been a prisoner at Auschwitz. She recalled seeing Allied planes in the sky over the camp (“little silver birds, maybe thousands of them”). But the bombs never fell. Lipstadt and Breitman had explained earlier that the planes were not able to reach Auschwitz until late in the war and that, in any case, bombing the camp would probably not have stopped the killing. But that did not satisfy the woman. The audience of several hundred, which had been largely subdued during the talk, suddenly erupted in applause and shouts of encouragement. It’s a scene that I have seen play out with minor variations many times over the last decade at similar public events about the Holocaust. No matter the evidence to the contrary, it has become received wisdom among many American Jews that Roosevelt deliberately and coldly abandoned Europe’s Jews in their hour of need. This marks a dramatic reversal in the image of a president who won more than 80 percent of the Jewish vote in all four of his successful campaigns, who surrounded himself with Jewish advisers and was portrayed by Hitler’s propagandists as Jewish (and not in a good way). Roosevelt brought thousands of Jewish professionals into government, prevented Hitler from overrunning Britain and Palestine (thus saving their large Jewish populations), chose to fight Germany first after the United States was attacked by Japan, and paved the way for New York’s first Jewish governor and senator. Presidential scholars have consistently ranked Roosevelt as the best chief executive in the nation’s history for his handling of the Great Depression and World War II. But even among liberal Jews who still hold him in high regard for those achievements, his reputation has been tarnished as he has been viewed increasingly through the prism of the Holocaust. What started out in the late 1960s as legitimate historical revisionism—looking critically at what the Roosevelt administration and American Jewry did during the Holocaust—has morphed into caricature, with FDR often depicted as an unfeeling anti-Semite. This historical debate has a significant contemporary subtext, one that helps explain the intensity of the passions it still arouses. That subtext is today’s debate among American Jews about Israel. In recent years, the distorted view of FDR has been promoted by a small group of Israel supporters who cherry-pick the historical record to portray his handling of the Holocaust in the most negative light possible. These scholar-activists deploy similar sleight of hand to paint a picture of most American Jews as having been disengaged and apathetic about the fate of their European counterparts at the hands of the Nazis, and to cast as heroes a small group of right-wing Zionists who mounted an aggressive public relations campaign to pressure Roosevelt to act. In this narrative, the complexities of history are erased and the passage of time is unimportant. The not-so-subtle message: like the Jews of Europe in 1939, Israel is under an existential threat and cannot count on anyone for help—even the United States, even liberals, even Jews in the United States, most of whom are insufficiently committed to Zionism. Betrayal happened before, and no matter how friendly a president or a country may appear to be, it can happen again. The most recent flare-up in the debate over FDR and the Holocaust, which has been smoldering since the 1960s, surrounded the publication in March of FDR and the Jews, a new book by Breitman and co-author Allan J. Lichtman. Both are historians at American University, and Breitman is also the editor of Holocaust and Genocide Studies, the leading academic journal in the field. Their study shows that when it comes to assessing Roosevelt’s role during the Holocaust, it is easy to find evidence to support the case that he made the best of a bad hand and just as easy to cite examples of his apathy. Over the course of his twelve years in office, Roosevelt swayed back and forth as the country veered from Depression-era isolationism to reluctant British ally to a nation at war. During that time, many in Congress and the powerful labor movement (including Jewish labor leaders) opposed immigration at a moment of record high unemployment. Though the State Department made it difficult for Jews to obtain visas, about 132,000, or nearly a quarter of all German Jews, found refuge in the United States—far more than were taken in by any other country. That same State Department also suppressed news of the Holocaust and frustrated rescue efforts, but it was ultimately overruled by FDR himself. Breitman and Lichtman write that Roosevelt “had to make difficult and painful trade-offs, and he adapted over time to shifting circumstances.” They conclude that he can reasonably be credited with saving hundreds of thousands of Jews. If Roosevelt’s scholarly critics acknowledge this achievement, they do so only grudgingly, and they argue he could have and should have done more. But so-called righteous gentiles—non-Jews who risked their lives to save Jews during the Holocaust, such as Oskar Schindler, whose famous “list” contained the names of 1,098 people—are not normally criticized for how many more Jews they could have saved. Instead, they are celebrated for those they did save in the face of the cruel and relentless determination of the Nazis to murder Jews. 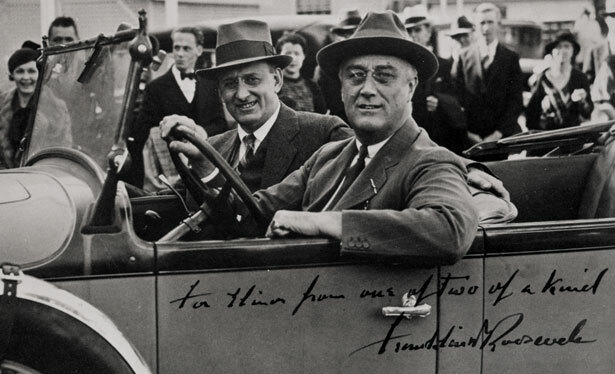 The question is why FDR’s list is now more often noted for the names it left out than for those it included. The flip side of the new anti-Roosevelt orthodoxy is the apotheosis of the Bergson Group, the aforementioned band of right-wing Zionists who worked to raise public awareness of the Nazi extermination campaign. Named after their leader, Peter Bergson, these activists have been transformed from a historical footnote into the stars of a counterfactual history in which the Jews of Europe might have been saved if only the Jewish establishment and the Roosevelt administration had listened to them. The Bergson Group has been the subject of several approving documentaries and books and even an admiring 2007 play by former New York Times reporter Bernard Weinraub titled The Accomplices, in which Bergson is portrayed as a prophet and Roosevelt appears as a conniving, two-faced anti-Semite. By far Bergson’s greatest modern champion is Rafael Medoff, a prolific historian, activist and ardent Zionist who has dedicated decades to the cause of pushing the Bergson story into the spotlight. Medoff is the founding director of the David S. Wyman Institute for Holocaust Studies, which is named after the author of The Abandonment of the Jews, a 1984 book about America and the Holocaust that became a surprise bestseller. In a blizzard of op-ed articles in The Jerusalem Post, the Forward and other publications, along with books, conferences and letters to the editor, Medoff has been at once a relentless critic of Roosevelt and a tireless promoter of the Bergson story. Through his efforts, the United States Holocaust Memorial Museum in Washington added a mention of Bergson to its permanent exhibit in 2008, and Yad Vashem, the Israeli Holocaust memorial, held its first symposium about the group in 2011. In February of this year, Medoff published a blistering attack called FDR and the Holocaust: A Breach of Faith, which appeared a month before Breitman and Lichtman’s more balanced assessment. In reality, Bergson is a minor figure in the history of the Holocaust. The accomplishments claimed by his champions are disputed by reputable historians, and the lessons of his actions are unclear. Born Hillel Kook, Bergson came to New York from Palestine in 1940 at the age of 25 as the representative of right-wing Revisionist Zionism, the bitter rival of the more mainstream leftist Labor Zionism and the antecedent to Israel’s ruling Likud party of today. After news of the Holocaust was officially made public in November 1942, Bergson and his colleagues took out full-page ads in The New York Times assailing Roosevelt and demanding that he do more to save the Jews. They put on a pageant featuring Hollywood stars called “We Will Never Die.” And they organized a 1943 march on the White House by 400 Orthodox rabbis. To Medoff and other Bergson champions, the group’s story provides a powerful counterfactual narrative. Had American Jewish leaders, including Roosevelt’s closest Jewish advisers, united with Bergson, they argue, Roosevelt would have been forced to mount a more serious rescue campaign earlier and tens of thousands more Jews would have been saved. The Bergson Group did show that American Jews had less to fear from going public with their demands than they thought. It successfully put together a coalition of non-Jewish senators and congressmen that pressured Roosevelt to act. But the Bergson Group was never directly responsible for rescuing a single Jew from Europe. According to its supporters, the Bergson Group’s greatest accomplishment was contributing to the constellation of events that led to the creation of the War Refugee Board in January 1944. The WRB was an interdepartmental government agency devoted solely to rescue that was created by an executive order from the president. It came into existence near the end of the Holocaust, but it cut through some of the red tape that had hampered previous rescue efforts to save as many as 200,000 lives. Breitman and Lichtman give the Bergson Group little credit for the creation of the WRB, a position also held by the late Holocaust historian Lucy Dawidowicz and others. But even if you believe the accounts of their greatest champions, the Bergsonites at most succeeded in softening up Roosevelt so that when Henry Morgenthau Jr., the president’s good friend and treasury secretary, confronted him with evidence that the State Department was blocking rescue efforts, the president immediately signed off on the idea of the WRB and issued an executive order creating it. In other words, the Bergson Group’s biggest feat is something that President Roosevelt created. He should have done it earlier and it could have been more effective, but doesn’t he deserve some of the credit for the 200,000 Jewish lives the WRB saved? Not in Medoff’s opinion. In the May 30 Washington Jewish Week, he wrote a column refuting this very idea headlined Jews were saved—but not by FDR. One of the supposed lessons of the Bergson story claimed by Medoff and others is that “unity” among American Jews during the 1930s and ’40s would have saved more Jewish lives. The implication is that today’s American Jews should not allow themselves to be divided on Israel. But Medoff’s framing ignores the legitimate disagreements at the time about the best way to combat the Nazi persecution of Jews, just as it ignores today’s disagreements among American Jews regarding the policies of the Israeli government. Actions such as a boycott of German goods and a proposal to ransom German Jews during the 1930s had their costs and benefits; well-meaning people were on both sides. Which policy should Jews have unified behind? And which policies should Jews unify behind today? Most American Jews support a two-state solution. Are right-wing supporters of Israel prepared to support a settlement freeze and a withdrawal from the West Bank for the sake of American Jewish unity? Breitman and Lichtman make a persuasive case that Wise and Bergson unwittingly pursued a strategy that pressed FDR from inside and outside, and which accomplished more than unifying behind a single approach would have done. Perhaps that is true. We’ll never know. And that is the point. By obscuring the context, the benefit of hindsight can actually make history harder to understand. During the 1930s, when immigration restrictions prevented more German refugees from entering the United States, Roosevelt couldn’t have known that the Nazis were later going to murder millions of Jews. But knowing what happened later, it is easy to portray him as callous. When he did learn about the murders of millions of Jews, he had no understanding of “the Holocaust,” which came later and is now so embedded in our consciousness that it is hard to imagine what it was like to live without such knowledge. Leaving aside the fact that historians question whether a bombing would in fact have made a significant difference, the parallels here are so thin—one would be a pre-emptive strike in a time of peace, the other an attempt to disrupt a war crime in progress—that Netanyahu had to acknowledge in the next breath that “2012 is not 1944.” But by raising 1944 in the manner he did, the Israeli prime minister effectively equated the Jews of contemporary Israel with the victims of the Holocaust and telegraphed what many Israelis and American Jews have come to believe: that Israel faces annihilation, and that the last time millions of Jews were similarly threatened, America and its Jewish community let them down. Israel is now sixty-five years old and a nuclear-armed regional superpower. It has many problems of its own making. Along the way, the United States has been a loyal ally. Telling a story that casts Israel’s Jews as perennial victims, and that purports to show that Jews must always go it alone, not only misrepresents the past; it also clouds our understanding of the present. Jana Prikryl’s “As They Live” (April 29) tells how photographer Roman Vishniac’s images of Jews were liberated from the lachrymose history he imposed upon them. Laurence ZuckermanLaurence Zuckerman, a former New York Times reporter, is an adjunct professor at Columbia’s Graduate School of Journalism.